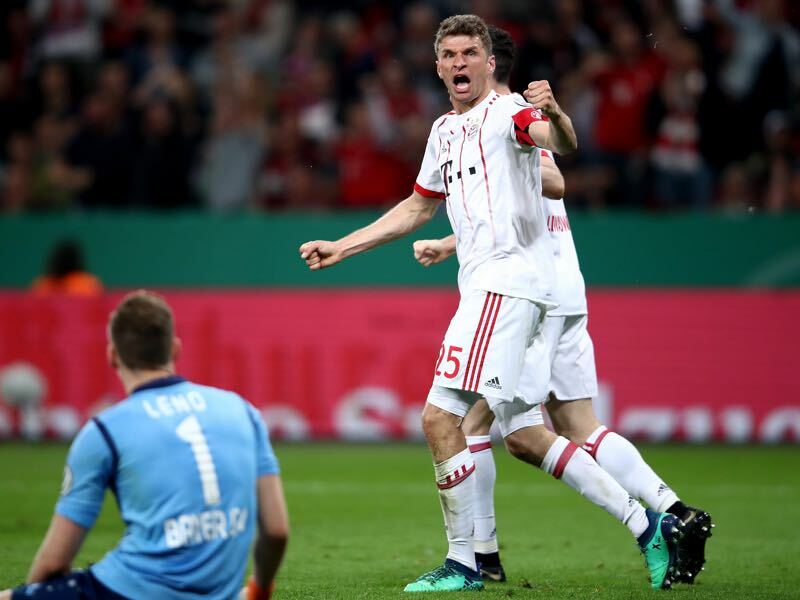 It was a much-anticipated match but in the end, Leverkusen v Bayern turned out to be a lesson in footballing dominance by the Bavarian giants. Bayern were aggressive right from the get-go and within just a few minutes had taken the lead. Jérôme Boateng crossed the ball from the half field; the ball found Thomas Müller, whose header from just three yards out was stopped by Bernd Leno. The ball bounced outside the box right to Javi Martínez, and the Spaniard made good use of the chaos in Bayer’s defence to score from 18-yards. Six minutes later Bayern had doubled the lead. Ribéry kicked things off with a fantastic dribble past Sven and Lars Bender to the byline and then lobbed a fantastic cross across the ball mouth where Robert Lewandowski was left wide open and the Polish forward easily scored from eight-yards out. Bayer were on the robes but not dead yet. In the 16th minute, Charles Aranguíz was brought down in the half field. Julian Brandt brought the ball in the box where it bounced around like a billiard ball until it finally fell to Lars Bender, who headed the ball across the line. Leverkusen had the next big chance of the game in the 31st minute after a corner kick by Brandt, which was poorly cleared by Bayern keeper Sven Ulreich and Lars Bender played the ball to his brother Sven and his close-range shot, however, was stopped by the Bayern keeper. Leverkusen sat deep but had the majority of chances. In the 37th minute, Brandt brought in another corner, which was cleared to just outside the penalty box where Karim Bellarabi unleashed a thunderous shot, Sven Ulreich dived to his right and did well to keep the ball out. The first half was a fantastic display of two teams that were eager to play football. Leverkusen wanted the equaliser, and it was only thanks to Ulreich that Bayer did not get the tying goal early in the second half. The keeper made two close-range stops in the 49th minute keeping Bellarabi and Kevin Volland off the scoresheet. Instead, Bayern scored the fourth game of the game in the 52nd minute. Thiago received a ball just outside the box and played a fantastic ball into the box where Müller was left open to score from just ten-yards out easily. Bayern were not done. Ribéry drew four defenders towards him with a fantastic dribbling, spotted Robben on the penalty spot who was dispossessed by Bayer’s defence but the ball fell to Thiago, and the Spaniard made it 4-1 in the 61st minute. The goal broke Bayer’s neck as just two minutes later Müller scored Bayern’s next after he was left wide open in the six-yard box where he scored his second of the night with his back heel. Bayer appeared to be beaten. 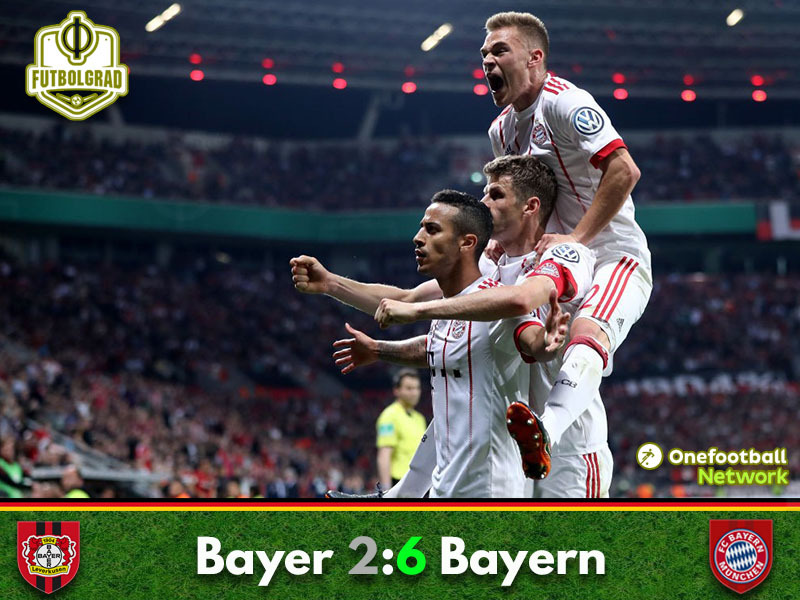 But die Werkself did not give up and in the 72nd minute Leon Bailey scored a wonderful free kick goal to bring Bayer within three. Müller, however, responded for Bayern. The striker received a long ball inside the box from Thiago in the 78th minute spun around his axis to turn Sven Bender inside out and then hit the ball home. It was Bayern’s final goal of the game as the Bavarian gave die Werkself a lesson in football. Thomas Müller was the Futbolgrad Network man of the match. The German national team forward scored three goals to record a hattrick and is now second in Bayern’s all-time DFB Pokal goal scoring ranking. Leverkusen were competitive for about 52nd minutes. Leverkusen had the chance to equalise right after halftime, but Ulreich kept Bayern ahead and shortly after Bayern scored their third. Bayer head coach Heiko Herrlich may have to ask himself whether he risked too much too early. Switching to a back three in the second half was perhaps a bit too risky, and with a tight scoreline, Herrlich was given a lesson on what happens when teams open up their backline against Bayern. Sven Ulreich made his 50th appearance for Bayern München. Müller scored his 27th, 28th and 29th DFB Pokal and past Bayern CEO Karl-Heinz Rummenigge. Only Gerd Müller (78 goals in the Cup) has scored more goals. Bayern have won the last 26 DFB Pokal games on the road.